Sarah Bear Crafts: Holy FO, Batman! 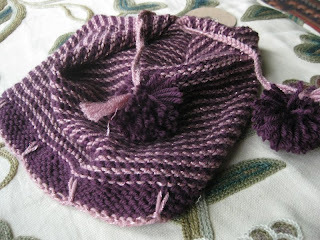 When I get obsessed with knitting--truly obsessed--I forget to blog about it. Well, I am still obsessed, but I'm working on a cardigan right now and those tend to bore me a little, no matter how soft the Debbie Bliss Alpaca Silk is on my fingers. Here are a few recently finished pieces! 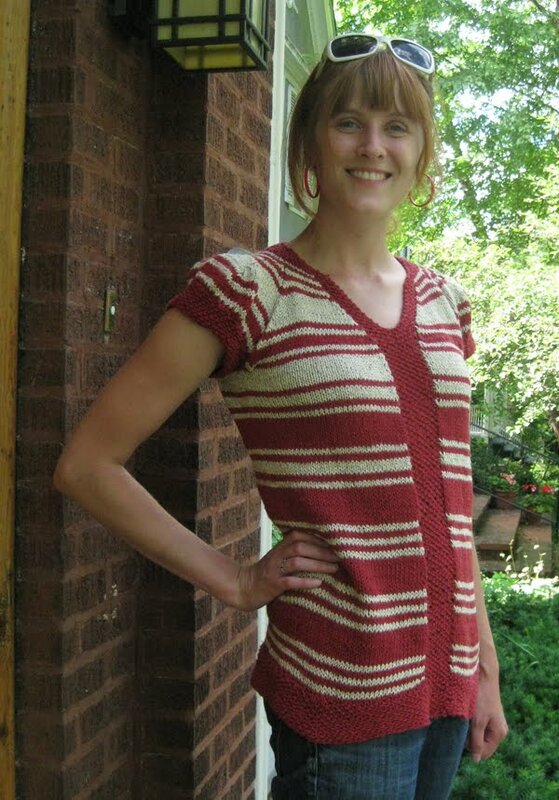 I test knit this pullover for Jennifer Thompson late this spring. 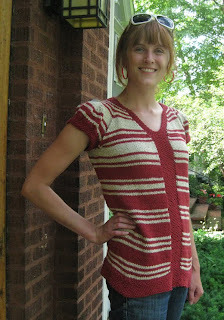 It was a really simple, quick knit, and flattering, too! I'm new to sweaters, and this was a pleasure--changing colors helps with the boredom of knitting a sweater, a tiny bit, and since it was bottom-up, all the exciting stuff happened at the end, making me stay up really late until I'd finished it! This guy, Vahl, was test-knit for the creative Alexandra Tinsley. I kind of stink at changing colors in the round, so there's a seam-like thing going up the back, but it's way fun! I gave it to my friend Tirzah at her bachelorette party last night! Pom-poms! 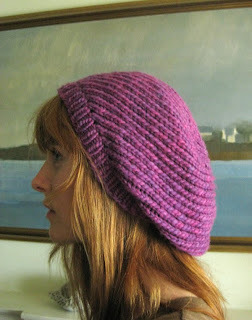 And as payment for the test, Alex sent me the Maelstrom Beret pattern I'd been coveting. I gave this as an engagement gift to my brother's fiancee, Liz. This is not Liz wearing it, but I bet it looks great on her! 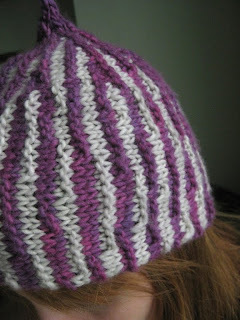 And then I attempted to design an illusion hat. I failed because head happen to be round and illusions need to be long. Stupid long illusions and round heads! 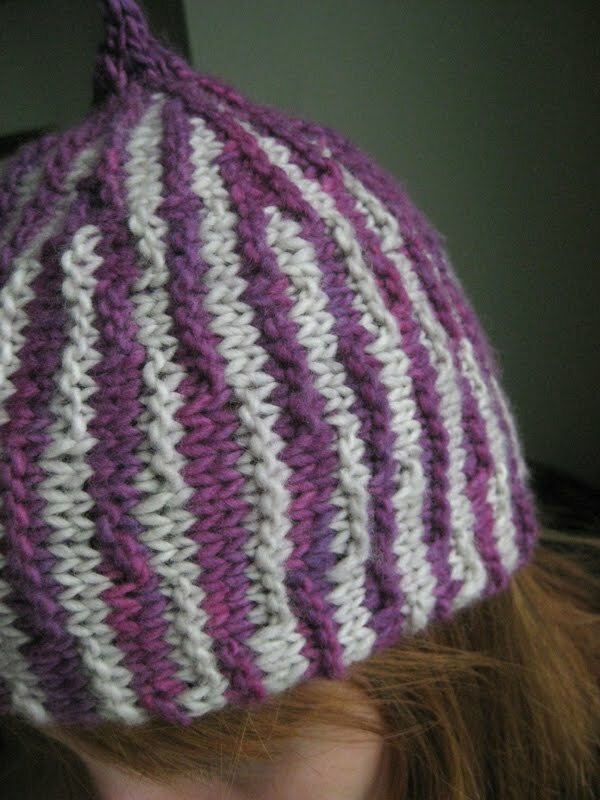 But I like how this stripy hat looks, and I'd probably like it better without the nubbly illusion attempts. I have an idea, but I think I'll surprise you with it! 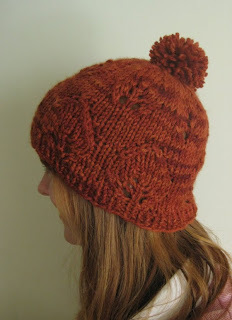 And down here is Reagan Rush's Leafprints Hat, bought with cold, hard, honest Pay Pal, but it's only $3.50! And I like it a lot.